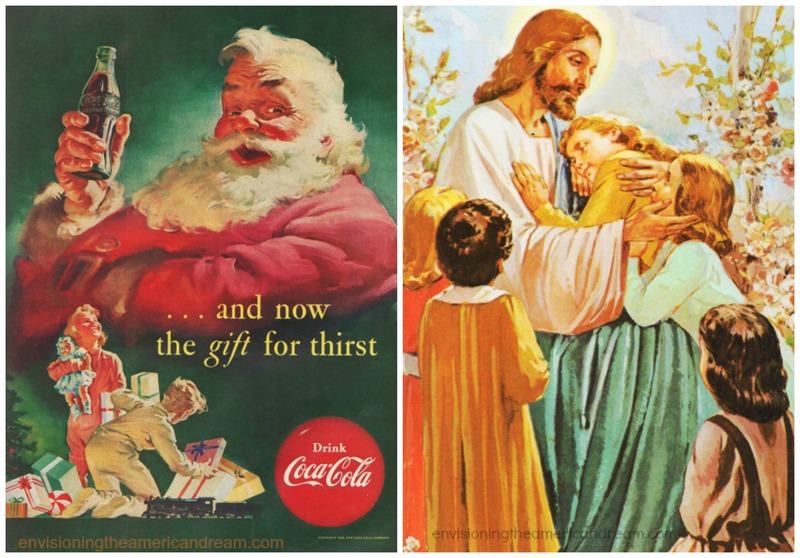 (L) Vintage Coca Cola Ad Xmas Santa 1952 (R) Vintage Illustration of Jesus from “New Catholic Picture Bible” 1964 Catholic Book Publishing Co. The great debate recently about the color of Santa makes me wonder- if that all time Christmas classic “I’m Dreaming of a White Christmas” could be written by a Irving Berlin, a Jew, who’s to say what color Santa actually is? I say why not 50 shades of Santa? Verified by who? Coca Cola? Spoiler alert- Santa isn’t real! This historical figure is a figure of our imagination, commercialized by the Mad Men of Madison Avenue for generations to hawk products ranging from kitchen ware to toys. The debate was sparked off by a Slate.com piece opining that perhaps Santa shouldn’t be portrayed merely as a white man anymore. Given the diversity of our country it’s not unreasonable. 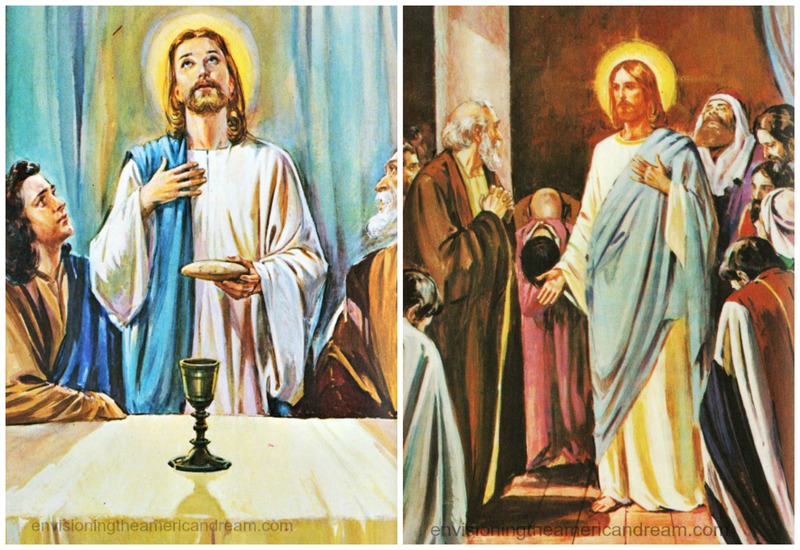 A decidedly blonde Jesus in illustrations from vintage children’s book “New Catholic Picture Bible” 1964 Catholic Book Publishers Co.
As far as that other historical figure, Jesus Christ, his oft time portrayal as a blue-eyed blonde is as fictitious as jolly old Santa, white or black. It is quite doubtful that Jesus looked like he was of Nordic descent. Jesus was born to a Jewish family in the Middle East, and most scholars agree that he most likely looked like what folks of Middle Eastern decent look like. Perhaps the best solution to that would be to color Jesus in whatever color you wish and everyone will be happy. “Welcome, my dear, to Santa’s workshop,” the jolly old elf said with glee in his eyes. I can have it ready for the holiday shopping season next year. What do you think? Of course his next line is asking if you’ve been naughty or nice! Heh. 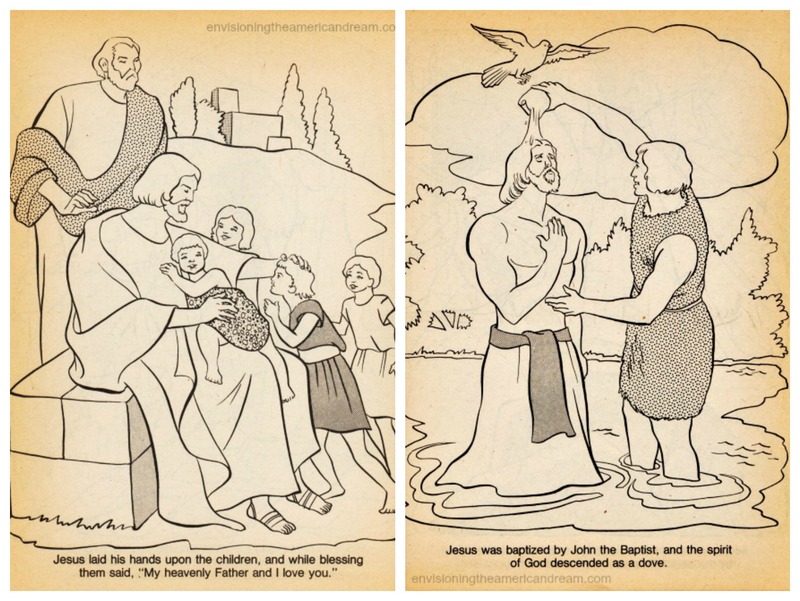 The only time I’d EVER seen Jesus looking anything like he (He) should’ve was in the Children’s Bibles the Jehovah’s Witnesses gave out. (Good reading, even if you aren’t a believer!) Nary a Kirk Douglas/William Shatner-looking Jesus among them! 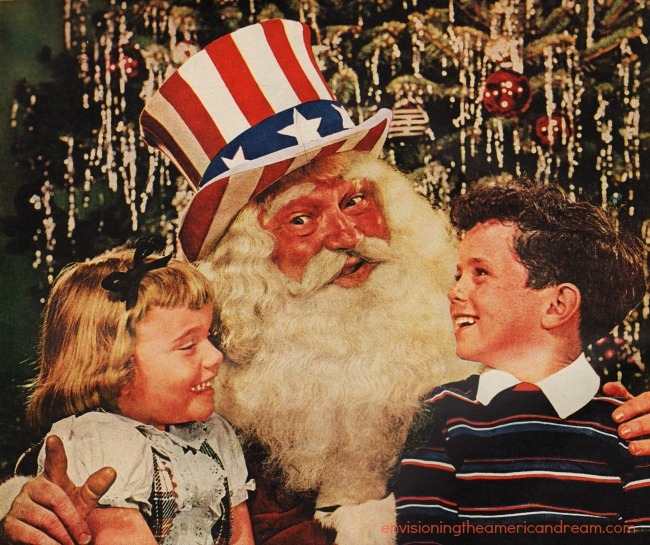 As for Santa Claus, I can’t remember a time that I’d even think he was real, but as a smart-aleck kid, I asked my mother what color Santa Claus was–her answer? “He’s Jewish (my father’s boss) and Native American and black! (my parents)” I always thought that was a good answer for kids who wondered why Santa was Asian, black, white, (or in the case of my piano teacher one year) black, white and Jewish!